Provide comfort for the family of Louise Fitzpatrick with a meaningful gesture of sympathy. Louise C. Fitzpatrick, 69, a longtime Poughkeepsie resident, died on March 14, 2019 at home. Born on October 24, 1949 in New York City, Louise was the daughter of Joseph and Catherine (O’Connor) DiZefalo. Louise graduated from Spackenkill High School. 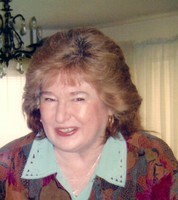 Louise was a part of the Technical Writing Department at IBM in Poughkeepsie until her retirement. She is survived by her cousins, Anne and James Sklenar of Beacon, Maureen and John Thomsen of Kings Park, NY, Rosemary Corno of Wenchendon, MA, Susan and Robert Bogan of Oakland, NJ, Helene and Charles Haver of Randolph, NJ and Joseph and Marion Schreiber of Oakland, NJ. In addition to her parents, Louise was predeceased by her husband, Bryan Fitzpatrick. Lou was a friendly and generous person with a larger than life personality. She will be missed by her family and all her friends, especially those in the rooms. Memorial donations may be made to St Jude's Childrens Hospital. Please visit Louise’s Book of Memories at www.mchoulfuneralhome.com. Consider providing a gift of comfort for the family of Louise Fitzpatrick by sending flowers. I remember Louise and Bryan from many years ago . When I was pregnant for my youngest son almost 31 years ago they went to Disney World and brought me back a silver engraved Mickey Mouse cup for my new baby. My son will be 31 in May I still have the cup and I always think of them fondly.